Thick clouds blanketed the night sky, making it especially dark in the river delta north of Mobile, Alabama. As our pontoon boat, the Pelican, crept up a narrow bayou, someone on board shouted, "There’s one!" Suddenly, a dozen flashlight beams cut the darkness, revealing dozens of red, glowing eyes surrounding us. In the thick of the vast Mobile-Tensaw Delta, we had entered the territory of the American alligator. As members of the popular Gators After Dark Tour, we would spend an hour getting up-close and personal with these ancient creatures, without getting *too *personal. If you’re looking for a unique and fascinating summer excursion, Wild Native Tours hosts the one-hour Gators After Dark Tour every Wednesday night From June to mid August. The American alligator was removed from the endangered species list in 1987. Timothy J. Our guide for the evening, Captain Chris Wiber, piloted the boat through the darkness and gave our 40-member group a wealth of information about what we were about to see. When asked why the tour takes place at night, Captain Chris replied that alligators tend to be less active during the day in the sweltering heat of the deep South. During daylight hours, gators prefer to lie low and stay cool. But, at night they become active, making it the perfect time for visitors to see them. If you join the Gators After Dark Tour, bring a flashlight, so you can scan the river banks for iridescent glowing eyes. When members of our group spotted gators, the captain would slow the boat and then shut down the engine, so we could float near the animals. Most of the time we only saw a gator’s eyes and a long snout poking out of the water. But, as we got closer to one, we could see its full length just below the surface. While the largest alligator recorded in the delta was 16 and a half feet, Captain Chris says people have seen plenty that were bigger. To estimate the length of an alligator, you observe the distance between its bulging eyes and then figure that every inch between the eyes equals one foot of body length. 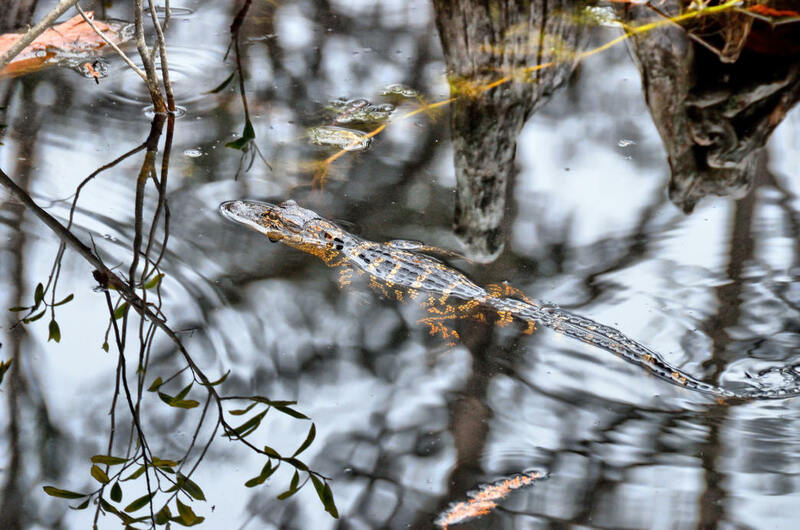 The delta is home to an estimated 80,000 American alligators, and you might get the feeling there are even more when you sail into Justin’s Bay and find the boat surrounded by hundreds of eyes. By the way, when gators gather, it’s known as a "congregation." As several people noted during our trip, most of the alligators we viewed appeared to be very young. As it turns out, many of them had hatched only a few weeks before. In the wild, mature alligators generally have no natural predators, but young gators sometimes fall prey to heron, osprey, and other birds and animals. Mother alligators do their best to protect the youngsters for the first year and act as formidable bodyguards. Sometimes, a mother alligator will hear her eggs start to hatch in the nest, and then help break them open. Then, she’ll scoop the babies into her mouth, wash them in the water, and introduce them to their new home. In 1967, the American alligator was put on the endangered species list, but it was removed from the list in 1987 and has thrived ever since. 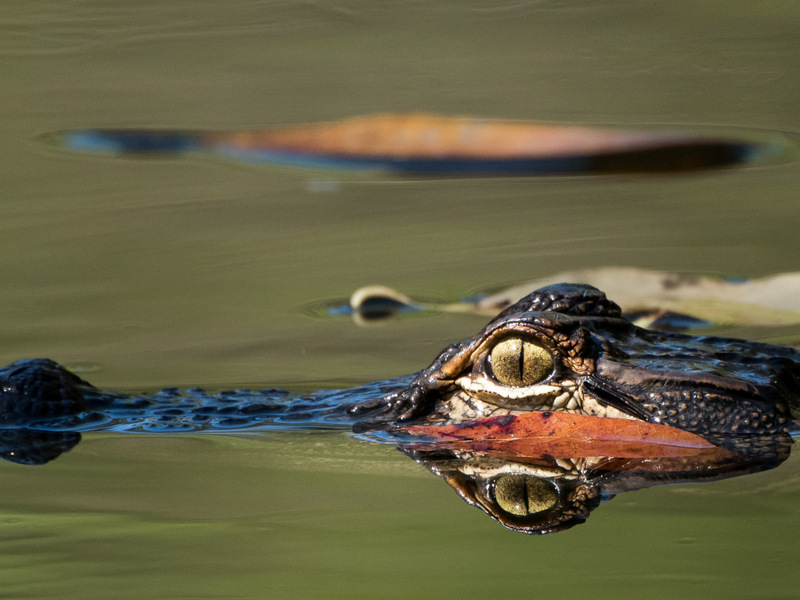 In fact, the alligator population has bounced back so significantly that several Gulf Coast states, including Alabama, have established alligator hunting seasons. In Alabama, the state holds a lottery and issues 265 tags or licenses, allowing a hunter to kill one alligator per tag. But, hunting an alligator isn’t easy, says Captain Chris, noting that gators are smart and sense when the hunt is about to begin. 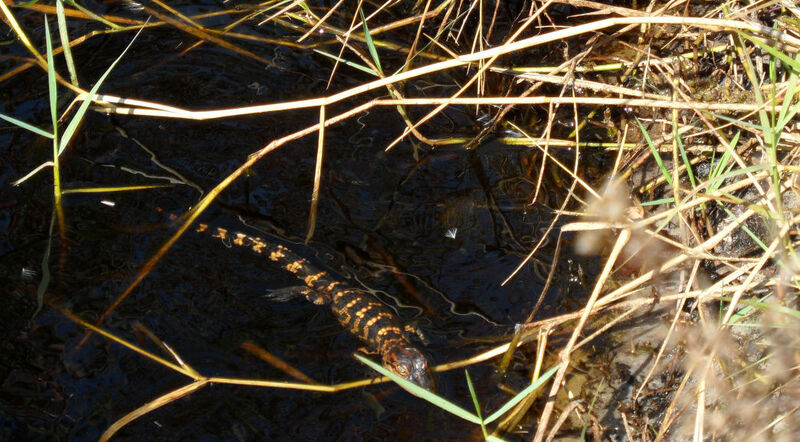 In fall and winter, the alligators seem to disappear completely. 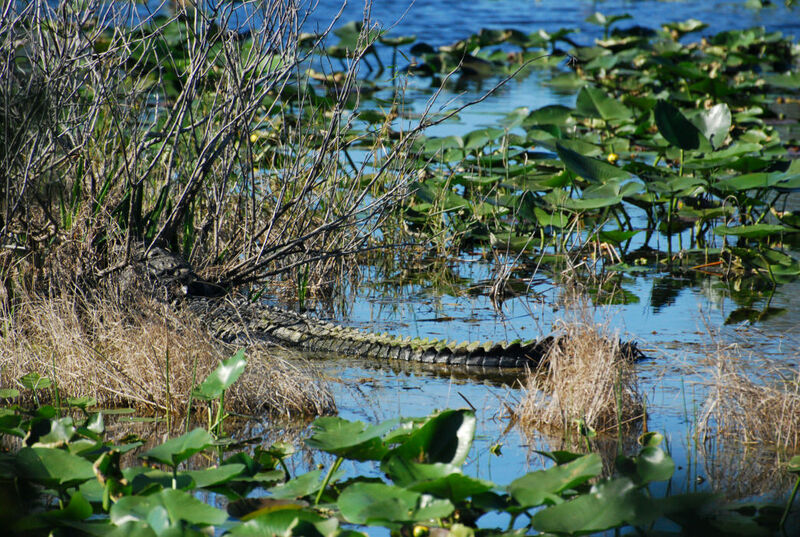 While many people assume that alligators hibernate, the animals really only go dormant. On the land near the water’s edge, they will dig a hole or den and lie there throughout the winter. While dormant, an alligator’s heart rate slows down so that it doesn’t expend a lot of energy, and it will come out to sun itself only on extremely warm days. Reservations are required. Visit the Wild Native Tours website for information, admission, and tour times. Bring a flashlight to help scan for gators. You can bring drinks and snacks, but don’t feed the alligators. Bring bug spray. Sometimes, the breeze keeps mosquitoes at bay, but most of the time they can be brutal.